As part of their company heritage all G&G gearboxes are made with one of the highest precision and innovation an airsoft company has to offer. Known as "The Black Rose," this is a special limited edition variant of the already unique G26. This airsoft gun is closely related to the GR15 platform, which shares the same reinforced polymer body and patented Pneumatic blow back system of its brothers. 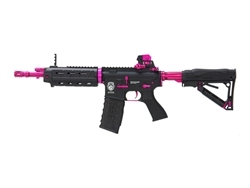 What is redesigned is its custom black handguards, black adjustable tactical rear stock, metallic pink barrel and delta ring assembly, metallic pink 6-position buffer tube, metallic pink fire controls, and a metallic pink and black rear metal iron sight, and even a rubberized high capacity magazine. More than a redesign, it features a re-engineered barrel assembly that for the first time in a mid level AEG there is now a integrated LED and laser attachment ( Powered by Cr123A batteries) that can be activated with a flip of a switch. Even at the rear stock there is a spare tube compartment that can store your spare batteries. Both cost effective and space saving it does away the need for extra rails or bulky parts that weight down this Macgyver of a rifle. 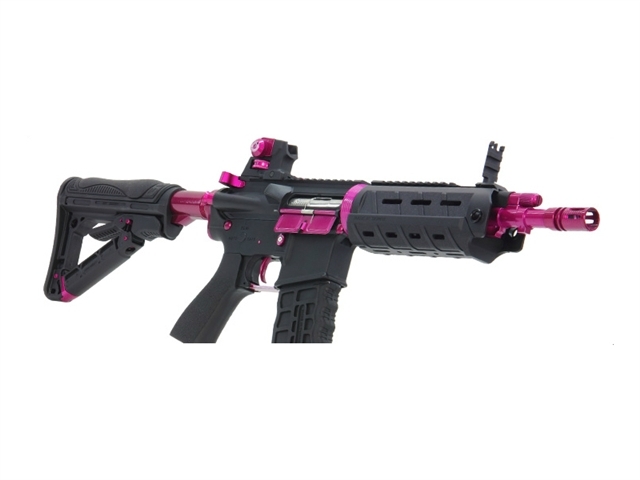 At the end of the day the G&G "Black Rose" will turn heads and snap necks in one fabulous swoop. With its Pneumatic Blow-Back system, this is a very reliable, balanced, and unique gun, shooting in the 350 FPS range - the maximum allowed FPS for many close quartered combat scenarios in many airsoft arenas. All this is housed within its high impact nylon fiber polymer body which sheds off weight and cost to give starting users a head start or veteran players an excellent platform for custom builds. While the revolutionary and patented blow-back system uses leftover compression of each shot to power a gun's bolt to pull back and forth simulating the cycling action of real steel guns providing a realistic, and satisfying, touch to your guns. Traditionally this feature was expensive and if not done correctly detrimental. Mainly because it encompasses jury-rigging the bolt assembly to the internal gearbox's which was difficult to install and remove, while putting strain on the gun's crucial parts. Note this gun does not come with a battery and charger, This AEG requires a specific battery G&G 9.6v 1500mAh NiMH 2-Piece Battery. The GR26 is not compatible with the standard brick or nun chuck style battery. The only other alternative is a small 7.4v Li-po brick.